Alongside the regular cast, Ronnie Schell is prominent as reporter Phil Gumm, an Action News correspondent keen to show that the stereotypes of a trigger happy, incompetent police force are grounded in truth. He asks and is assigned to ride along with Hammer and Doreau, together with his cameraman (Erik Cord). Things take a turn for the worse when the group are forced to hijack a car driven by a student driver (Lisa Robins) and take part in a high speed chase. Also supporting the story are performances from Coleen Maloney and Duane Whitaker as rowing newlyweds, Robert Hallak as an armed robber unlucky enough to be caught in the act by Sledge and the film crew, Jennifer Barlow as a cringeworthy singogram that Hammer wants to send Gumm when he is injured in a car crash and Leslie Morris in the first of his 31 appearances as Officer Majoy. Charles (Chuck) Braverman directed the episode, his first of six appearances behind the Sledge Hammer camera, working with a story by future Simpsons stalwarts Mike Reiss and Al Jean, the first of their five collaborations for the show. 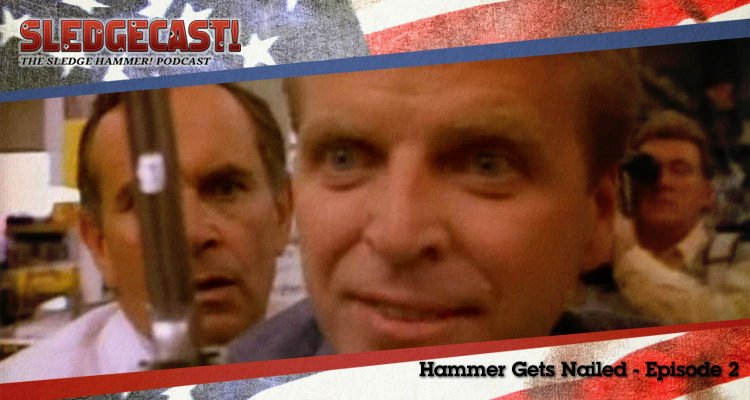 If you have thoughts on any aspect of Hammer Gets Nailed, please share them below, or find us on Twitter at @sledgecast. Hammer Gets Nailed was released in 1986. It is 30 minutes long and originally aired on the ABC network. This episode is available on the Sledge Hammer DVD box set from Laser Paradise (German/English language) in Region 2 and from Image Entertainment in Region 1 (USA).